Units Consumed: Units consumed is the number of kWh (Killo-Watt-Hour) consumed in a month. 1 kWh is equivalent to keeping a 100 Watts bulb on for 10 hrs. This information is calculated by finding the difference between meter readings of two consecutive months. This is the total monthly consumption by all the appliances that are connected to the meter. This is the value that needs to come down in order to reduce the electricity bill. An observation of consumption history can give an indictor of the appliances having higher electricity consumption (typically Air Conditioners increase consumption in summers). Fuel Adjustment Charge (FAC): As you can see in the tariff structure above, there is a FAC rate applicable at each slab. This is the additional cost of power incurred due to fuel price increments during a year. Fuel in most cases is Coal. As per a study, after 2011, the production rates of coal will decline, reaching 1990 levels by the year 2037, and reaching 50% of the peak value in the year 2047. So invariably FAC will increase till alternate sources of electricity are not developed to a state where they can generate electricity that cheap. So electricity costs will surely increase in future. 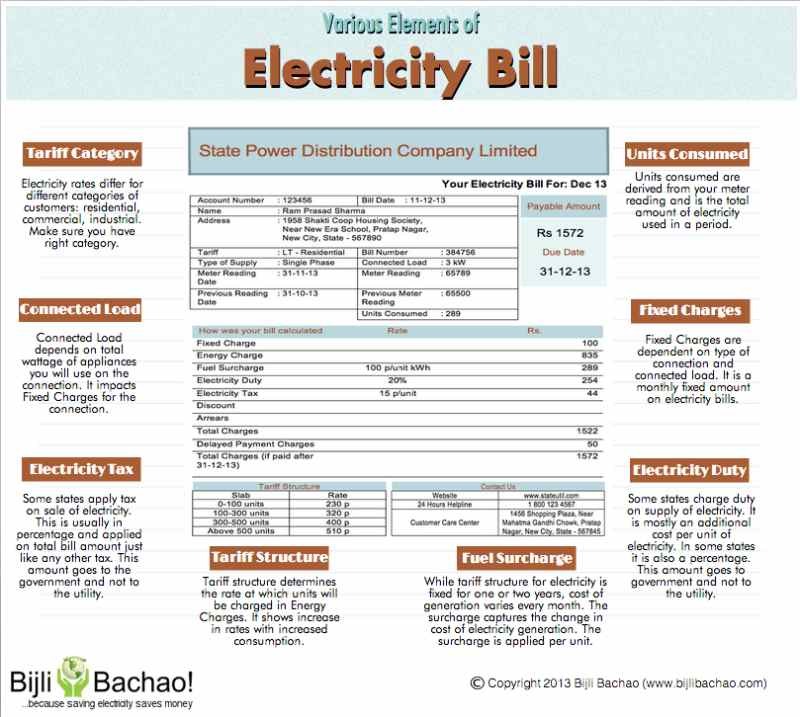 Understanding the elements of electricity bill mentioned above can help you understand your electricity bill and will also help you to plan your electricty consumption reduction project. Two things that should be targeted are: Units Consumed and Connected Load. Reduce the two and your electricity bill will surely come down.